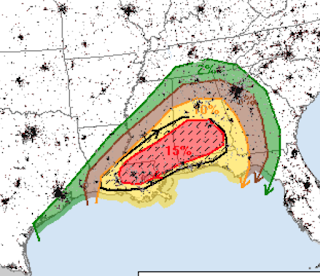 Here is the updated "tornado only" probabilities from the Storm Prediction Center. Five percent (brown) is the significant threshold (which includes Atlanta). Fifteen percent is quite high. The hatched area is where violent tornadoes are forecast to occur. A number of school districts have called off school. Making sure you have a shelter area ready to go. It should include a flashlight with fresh batteries. A radio or television that will work even if the power fails. If you don't have a TV/radio of that nature, a smartphone will work. Make sure you wear shoes into the shelter. If you are hit, know where to turn off the electricity and gas. If you have an infirm friend or relative, make provisions now. Make sure you have adequate gas in the car. Pumps in your area may not be working if the power goes out. I no longer "live blog" storms but I will update at least two more times today.